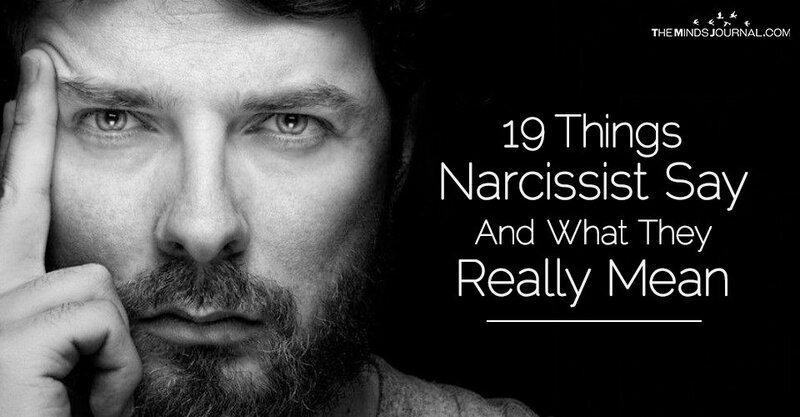 Have you ever come across a narcissist? According to psychology, a narcissist is a very egoistic person who fantasizes themselves to be greater than people around them and immersed in this self-love, they expect others to give them a very special treatment without any reciprocation of the same. You might feel that these characteristics can easily be spotted but it’s not as easy as it seems. Narcissists are masters of manipulation. They are experts in using words to protect their lies and to earn your love and support. Narcissists lie but the phrases they use are not lies, they are facades. They will use this art of expression so well that even if their deeds fail to validate their words, you would find it difficult in believing them. But you would never want to fall in the trap, would you? So, to make things easier to identify, we have a range of phrases for you which a narcissist tells another person and the real meanings they hide behind them. 1 “I love you” = “Damn! You can figure out my real intention. I need to distract you. 2 “I am sorry” = Hey, just forget what happened; I need some attention. 3 “You are my soul mate” = Oh…I’m enjoying this high level spiritual feel for the time being. 4 “That never happened.” = Yeah, I made a mistake but I don’t want you to talk about it. 5 “You are too sensitive”= Cut the crap now; stop talking about my bad behaviour. 6 “I am your mother” =I get the right to have full control over your life. 7 “Forgive and forget” = Keep on tolerating my abuse all the time. 8 “I have never met anyone like you” = You all are the same. I’m texting 7 other women the same thing now. 9 “My ex girlfriend was crazy.”= My ex girlfriend came to know about my abuse. But I want don’t want you to know the truth from her. 10 “I have been really wanting to settle down” = Since I’m talking about settling down, you should believe that I am a responsible guy and hence, a nice person.